That’s what Emily Campbell ’17 learned during her Kellogg Institute Experiencing the World fellowship (ETW) last summer. Her experience in Rwanda focused her future academic work, affirmed her career goals, and motivated her to make lasting international development change. “In my first anthropology class, with Assistant Professor Cat Bolten, I was interested in the ideas that came up in relation to gender, violence, and culture,” said Campbell, now an anthropology, English, and Italian studies triple major. Campbell particularly welcomed the idea of being able to combine research with teaching. She designed an independent research project, wrote a grant proposal with Bolten’s guidance, and learned in the spring that she had received a fellowship. In mid-May, she flew to Rwamagana, Rwanda, where she worked as an English teacher at Nsinda Ikirezi, a Christian primary boarding school for boys and girls, while conducting research on the everyday experiences of Rwandan schoolgirls. Campbell enjoyed bonding with the girls she lived with, all between the ages of 9 and 13. In a lesson on the importance of flexibility while conducting international field research, Campbell changed her research topic dramatically upon her arrival in Rwanda. Ultimately, she focused her research on exploring, through conversation and interviews, the complicated experience of schoolgirls in this rural area of Rwanda. “Women are expected to be submissive and silent; they are not permitted to have an opinion unless it agrees with and is asked for by a male,” she said. “Through the ingraining of this culture of submission, young girls learn that they are voiceless and powerless against male authority and force. 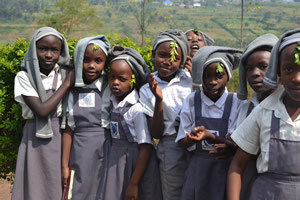 As girls get older, this complicates their experience as young Rwandans. They have been taught not to speak out and thus tend not to object to sexual assault or abuse, arranged marriage, or domestic violence. Her experience in Rwanda changed her life, Campbell said, setting her on a path to solve major development problems while maintaining an anthropological focus on culture. And, confronted by the reality of the ways in which gender and violence affect Rwandan schoolgirls, she is more focused in her course selection at Notre Dame, choosing classes that involve topics of gender or violence, or the way the two affect children. “Moving forward, I am interested in pursuing a master’s or Ph.D. in anthropology, potentially in combination with public policy. I want to combine the two and look further into how you can use anthropology to make interesting, new, culturally sensitive approaches to international development issues,” she said. Campbell is enthusiastic about encouraging interested students to apply for an ETW fellowship. “I’m a big proponent for stepping outside your comfort zone,” she said. “I think that’s the only way you learn to grow as a person.